Are you planning ahead for March? I have some items to make March a little more fun in your classroom. This game is a big hit with the 3rd grader that I tutor. She loves playing bump to practice math facts. To play, you use a paperclip and pencil as a spinner and then ten markers/math manipulatives for each player. Spin and multiply that number by the big number in the corner ( there is a different board for numbers 1-10.) Find the answer and cover it. If another player's chip is on the spot you can bump it off. If you get two chips on the same number, you lock it and can't be bumped. First one to use up all their chips is the winner. This bingo game includes 30 boards - each different. There is a colored set and a black/white set. Just pick the way you want to print and play. Easy and simple way to fill time and practice St. Patrick's Day vocabulary words. In March, we always celebrated March Is Reading month. We always planned school wide activities throughout the month to promote reading. I liked to do something special in my classroom to get my students excited about reading. One year, I decided to do classroom awards for the books in our class. I decided on categories ahead of time and then explained each category to the students. They each had to come up with one book to fit one of the categories. They had to write about it and illustrate it and explain why that book should be the winner in that category. They could use any book in our classroom library or any book I'd used as a read aloud (my teacher books we called them). After we shared all of our nominations and wrote them down, we added other books to even out the lists. Then the students had all month to read as many books as they could from the nomination lists. At the end of the month, we voted and announced the winners. The winning books got a special award to stick on their covers. Included in this file is detailed directions, category ideas, nomination forms, category lists and printable awards. This was one of my favorite activities to do with my 2nd graders on St. Patrick's Day. I would have all the students bring in junk that would normally be in their recycling bins at home - paper towel rolls, boxes, cardboard, plastic containers, etc. Then the students took turns picking junk from the pile to make a leprechaun trap. After they designed the traps, they had to write a how to piece to explain how they built their traps. Then we shared. 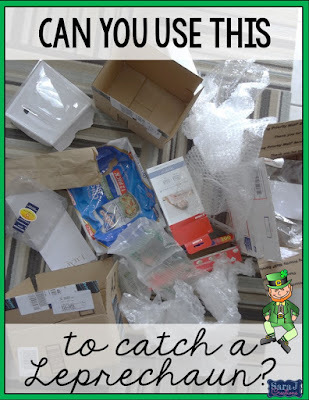 This file includes directions, parent letter, writing paper and special notes for the leprechaun to leave behind. - comparing & ordering numbers, fractions. Those are just a few ideas for what you can use in March in your classroom.